Ashington FC’s player/manager Steve Bowey praised his outfit for showing character and desire as they rallied from being 4-0 down at half-time to force a nail-biting finale after pulling three goals back against Blyth AFC on Saturday. However, Bowey was highly critical of his outfit’s first half display and brandished it ‘not good enough'. He said afterwards: “I’m disappointed that after the hard work we put in second half we’ve come away from the game with no points. We started well and had a good 10 to 15 minute period where we put them (Blyth AFC) under a lot of pressure - but it’s the old cliché where you have got to take your chances. "To be honest, they had four shots and scored four times – but we gave them the goals with individual mistakes. I back my players to the hilt when they play well but they have got to learn – and learn fast – when things go the other way. "We had an experienced team out on the park but when you go in at half-time 4-0 down, you think – can it get any worse? We were never going to play that bad throughout the full season an,d at the interval, we simply had nothing to lose. 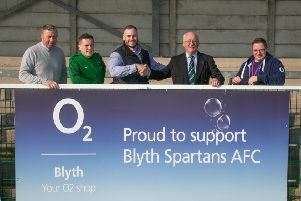 We had to go at them (Blyth AFC) and had to show something because if we didn’t, then it could have ended up six or seven. games in 45 minutes – but we lost one in the first 45 minutes. He went on: “We can take a lot of positives from the game with players showing character but we have got to take this defeat on the chin and dust ourselves down and go again. We’ll analyse the performance and look at what we can do better and rectify it. Bowey reflected on the promising strike force of Zak Atkinson and Damien Stevens: “I thought Zak was excellent and when Damo came on, they showed that they could be the best partnership in this league by a mile. The two of them linked up really well and their combination play was evident from the off. Meanwhile, Bowey had words of consolation for Kyle Downey who saw a second-minute penalty saved by Blyth AFC goalkeeper Chris Bannon: “Nobody goes out to miss penalties and unfortunately for Kyle, it just didn’t happen and the keeper has made a save. Kyle is gutted in the dressing room like the rest of the lads but it’s how you react after a defeat.